Ornate beauty. 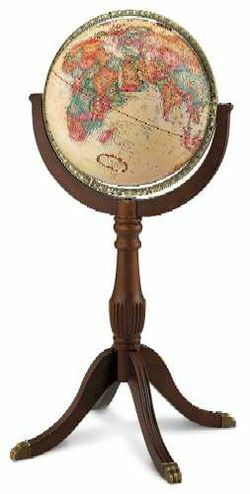 An elegant solid-wood stand with brass claw feet and antique brass-plated meridian enhance the rich antique ocean of this classic 16" diameter raised-relief globe. Special details include decorative cartouches and ornate compass roses. Truly a beautiful furniture accessory.